Quirky, freckle-faced Annie May Parker, who believes in omens and spirits, is coming of age in the 1950s in central New York farm country, the middle sibling between a boy-crazy older sister and a lovable little brother in a family headed by a hard-working traditional widowed mother. Annie May discovers a trove of dusty journals in the attic of the family farm house that hold stories of the courage and deeds of daring of a diverse set of family ancestors whose spirits she is certain are watching over her. Determined to make them proud she sets out to make her mark in the world. Just as she is about to begin a coveted teaching job a letter and photo arrive at the Parker household which forces Annie to choose between rescuing her family’s ancestral heritage, an act that would take her half-way around the world to life she never would have imagined, or her budding career. In making that choice she is also forced to come to terms with a long-held love she never dared to admit. 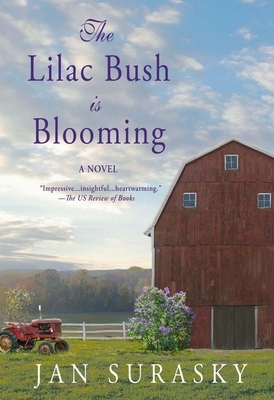 Beautifully written, with ancestral tales charmingly intertwined throughout the major plot, The Lilac Bush is Blooming plumbs our deepest emotions and leaves us with memories of a farm family connected not only to their land and their heritage but most especially to each other. Jan Surasky is a former writer for a San Francisco daily newspaper. Her many articles and short stories have been published in national and regional magazines and newspapers. Her award-winning novels include Rage Against the Dying Light, Back to Jerusalem, and The Lilac Bush is Blooming. She lives in upstate New York.